Isfahan is one of the jewels of Iran, famous for its bridges and the blue-domed mosques of Naqsh-e Jahan square. But there are so much more wonders to discover in this ancient Persian capital and this cullinary walk tour will give you the opportunity to explore the city through a really unique lens. During four hours into the historical parts of the city, you'll learn everything about Isfahan's food culture, discover how Islamic medicine influenced the local cookery and taste local sweets, drinks, and various foods gleaned in local shops. Into the magnificent old Grand Bazaar, you will visit the colorful spice section and be introduced to the use of plenty of unique and local ingredients. Wandering in the alleys, you'll easily enjoy walking, shop souvenirs while observing the vibrant local life and its activities. Visit a copper workshop, or observe and learn the way of handmade manufacturing of "Ghalamkar", a delicate type of textile printing uses as the table cloth splendidly that Isfahan is famous for. After all these delights for your senses, it will be time to sit and finally enjoy a delicate lunch in a local restaurant with all of the most delicious local cuisines. Along with a true connoisseur of Isfahani food culture, you will go on an exploration of several historical places. You will, of course, visit the majestic Grand Bazaar and its ten centuries of history. Walking through the alleys, you will be introduced to local and unique products, such as fresh herbs, vegetables, and spices. Your guide will describe to you how people use them and share their history. 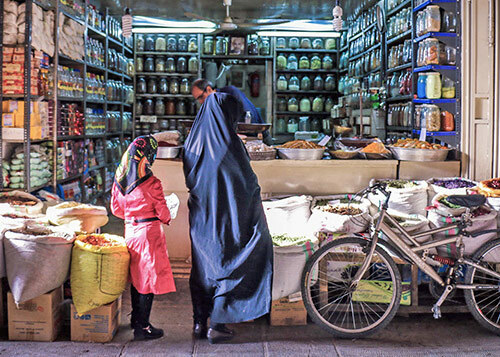 You will learn, for instance, how Islamic medicine has influenced the local cookery and observe how Isfahanis make different seed oils. Visiting various specialized shops, you will taste several local foods and pastries, such as "goosh-e fil", a sort of Iranian doughnut. Your exploration will also lead you to a "gaz" shop, the most famous Isfahani delight. To get some refreshment, you will make a stop in a sherbet house, to taste those unique sweet herbal drinks. Your tour will not only introduce you to the traditional Iranian foods but will also allow you to figure out traditional jobs and activities: in the copper section of the bazaar, you will observe the ancestral work of craftsmen. You will also observe the traditional process of making "Ghalamkar" in a local shop, a unique type of hand-printed Persian fabric. At the end of this tour, you will be recalling what you experienced since morning in an authentic traditional restaurant, and enjoy a delightful and local Isfahani lunch sharing your enthusiasm about half of the world. The tour starts at 10 a.m. Your walking tour with the concept of food leads you to magnificent historical places in the city center of Isfahan which are all well known to history and architecture enthusiasts. You will find out why there is called "Half of the World" and go in various kinds of food shops, pastries, bakeries, teahouses. Your guide will introduce you to the different spices in the dedicated section of the Bazaar. At the end of the tour, enjoy a fancy seasonal lunch. The tour ends at 2:00 p.m.